When I am reading about new tools I always think about how these tools will help me on the job. When I see the new sub-compact 2412-20 M12 SDS-Plus Rotary Hammer I think of all the times I had to run hundreds of feet of extension cords so I could drill holes to set door thresholds at hotel jobs. The 2412-20 seems perfectly suited for these types of jobs. The 2412-20 is really small at only 9 inches in length and weighs in at only 3.9 lbs, which is surprising considering it can drill holes up to 1/2-inch into concrete. It also features a 2-mode drilling operation that allows the hammer mode to be turned off if the application calls for it. 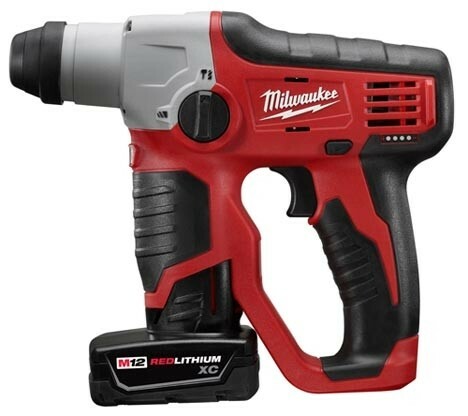 The M12 Rotary Hammer delivers 0-800 RPM, 0-5,350 BPM, which Milwaukee says is 4x faster than their competitors, and it can drill over 55 holes on a single charge. Those numbers are likely measured while using the XC High Capacity M12 Batteries, which are included in the kit. Like all of the next gen lithium tools coming out of Milwaukee, the M12 Rotary Hammer also features the Milwaukee Redlink computer system that allows the battery to communicate with the tool and the charger to ensure you get the best performance out of the batteries. The 2412-22XC Kit Includes 2412-20 M12 Cordless 1/2-inch SDS Plus Rotary Hammer, (2) Red Lithium M12 XC Batteries (3.0ah), Charger & Carrying Case.